Commissionerate Of Transport, Assam Recruitment 2018 July | Junior Assistant/ Stenographer/ Computer/ Enforcement Inspector Vacancies :- Applications are invited in the prescribed standard form (Published in the Assam Gazette) Part-IX, from the intending candidates to fill up the post of Junior Assistant (H.Q. & District), Asstt. Enforcement Inspector, Enforcement Checker, Stenographer and Computer under the Commissionerate of Transport, Assam. We shall discuss more about this government Jobs in Assam in the below section. In this section, we will discuss in detail about Recruitment of various posts under Commissionerate Of Transport, Assam Recruitment 2018 with all the details and requirement. Education Qualification: Candidates must have Bachelor’s Degree from a recognized University of any examination declared equivalent by the Government. Education Qualification: Candidates must have done 10+2 (intermediate/ HSSLC) from a recognized Board of any examination declared equivalent by the Government. Education Qualification: Candidates must have passed Class 10 (HSLC) from a recognized Board of any examination declared equivalent by the Government. Age Limit : The candidates should not be less than 18 years and not more than 43 years of age on the 1st day of January’ 2018. The upper age limit is relaxable by 5 years in case of candidates belonging to Scheduled Caste and Scheduled Tribe, and in respect of ex-servicemen, age limit is relaxable by two years. The age limit of the candidates will be calculated on the basis of the Matriculation / HSLC Admit Card / Certificate issued by a recognized Board / Council. No other document shall be accepted in lieu thereof for the purpose. 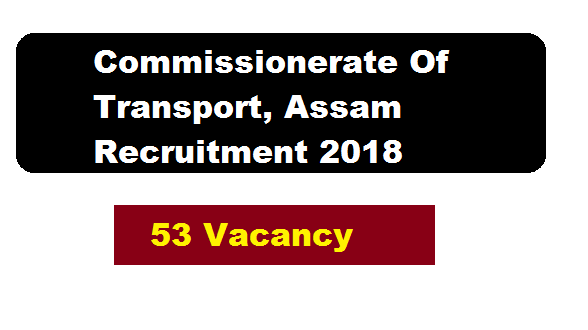 We shall now discuss how you can apply to 53 various posts under Commissionerate of Transport, Assam Recruitment 2018. (v) Self-addressed postage paid envelop of 10″X 4.5″ size. What is the syllabus for junior assistant posts? ?